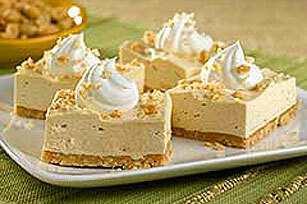 Chopped peanuts and peanut butter add a double dose of peanut flavor to these no-bake, cream cheese dessert squares. Mix wafer crumbs, peanuts, granulated sugar and margarine. Remove 2 Tbsp. of the crumb mixture; set aside. Press remaining crumb mixture firmly onto bottom of 8- or 9-inch square pan; set aside. Beat cream cheese and powdered sugar in large bowl with electric mixer on medium speed until light and fluffy. Add peanut butter; mix well. Gently stir in 2 cups of the whipped topping. Spread evenly over crust. Refrigerate 4 hours or until firm. Top with the reserved crumb mixture and remaining whipped topping just before serving. Store leftover dessert in refrigerator. Save room for this special occasion dessert by planning ahead. For example, watch portions and choose lower-fat foods beforehand.